The standard loser line, “I’LL WAIT FOR YOU IN HELLLLL!!!”. Ryou & Ken: “NAH… WE ARE HELL!!!!”. My head just gone numb after drowning with so much violent scenes, Mazinkaizer SKL dynamic movment and the group of beauties =P. Just in case you ask where to watch, I bought the Mazinkaizer SKL Starter Pack which includes the Super Robot Chogokin Mazinkaizer SKL and the episode 1 anime – Death Caprice DVD. It is raw so I’ll try my best to write this review. 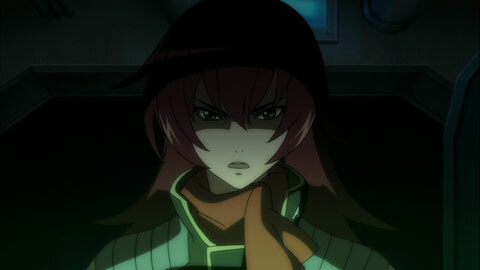 Scarlet Hibiki, the leader of Gren Falcon Squad. Too bad She died really fast at the beginning, together with the whole team. She is the pilot of Wingle in the Mazinkaizer SKL manga. This is a great example you don’t have to flash your stripe pantie and scare of ghost to win audience’s heart. She is pretty cute and stand out compare to other anime females =P. 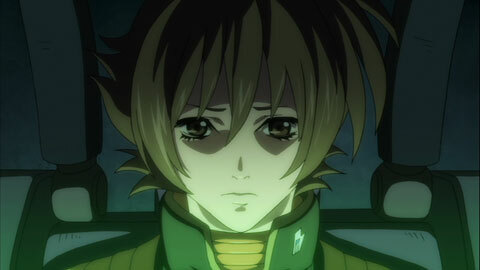 Tsubasa Yuki, an engineer of Gren Falcon Squad. Suppose to be a support role of the mission but she is the only one survive when they break through the Gravity Curtain. 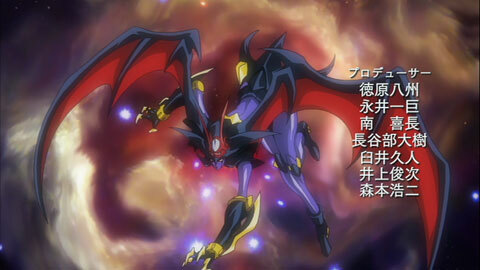 Apparently she will be the pilot of Wingle in Mazinkaizer SKL anime. I like her since she is the only normal person that hardly get in the way. Spoiler alert – Read this at your own risk. The story started where the Gren Falcon Squad is preparing to penetrate the Gravity Curtain (a storm barrier). The team is lead by Scarlet Hibiki, the team leader and their mission is to stop the unstable Gravity Curtain generator located at a unnamed island. The mission need to be done within 66 hours before it overload and destroy earth. The Gravity Curtain that quarantine the 3 nations (Garan, Kiba and Aira). Right after the team penetrated the Gravity Curtain, random flying bullets hit the ship and killed everyone other than Tsubasa. 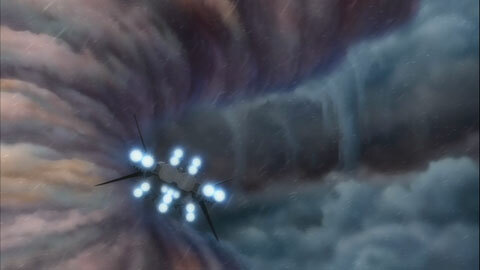 She quickly escape with a Pilder and caught into the war between Garan and Kiba army. Just when she is in danger, a mysterious Majin appeared and chopped the enemy into pieces. As we expected, it is the Death Caprice team – Ken, Ryou and Mazinkaizer SKL! It simply trashed those random units and fight with Kiba’s Bakuryuki. 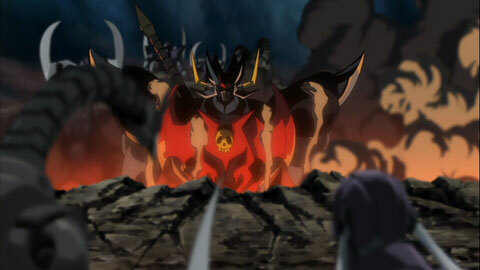 Because of the Garan’s army interference, Kiba retreated without setting the score with Mazinkaizer SKL. In the same time, Aira, Leader of the Aira Army (aka Hachiryokaku) saw the image of Mazinkaizer SKL in its fortune telling where it will save the nation from the war (apparently they are losing). Tsubaki was saved by Hachiryokaku and she discuss the Gravity Curtain issue with the leader. In order to calm the Gravity Curtain, it requires all the 3 control devices from each nation. However, due to the war, it is technically impossible to ask for the cooperation of the other two. 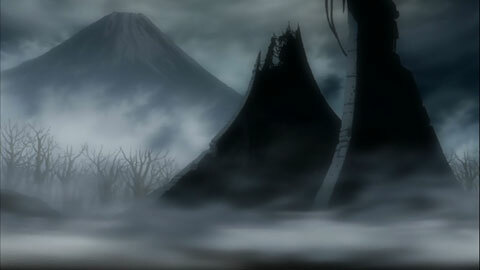 At this moment, Kiba leads his army and attacks Hachiryokaku. 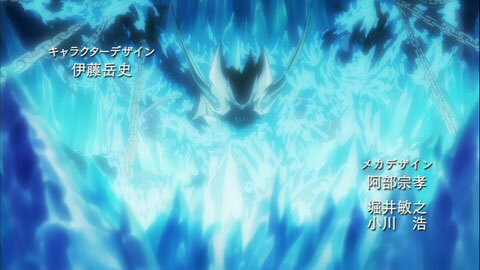 The scariest scene in Mazinkaizer SKL – Psycho Gear, mass produced Aphrodite A. By the way they have different hair style. 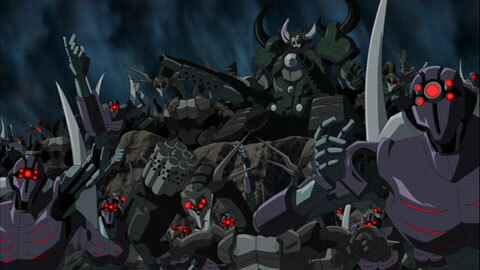 Aira army immediately launches their Psycho Gears to combat with Kiba’s troop. No matter how I look at it and they looks like mass produced Aphrodite A (that explains why they are losing!). 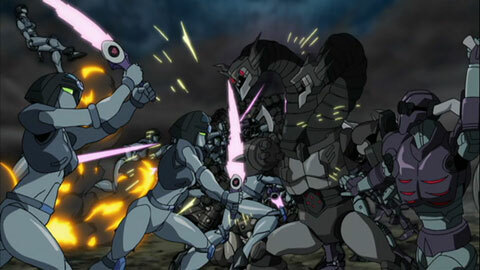 Although the Psycho Gears and their pilots are kinda pretty, they shared the same fate as Aphrodite A and died horribly. 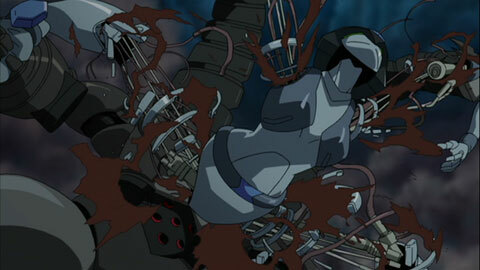 You can find blood, red oil, tearing, guts and death anywhere in Mazinkaizer SKL episode 1 anime. Just when they are losing, Mazinkaizer SKL pops up from underground (how the hell it gets there?) and engage into battle! Due to Tsubaki request, Ken and Ryo (the Death Caprice Squad) form an alliance with Aira army. Although Hachiryokaku don’t really trust the power of Mazinkaizer SKL, they can’t do anything but see how it kicks enemies assess. Good morning guys, I come in peace (YEAH RIGHT). Skull Pilder On! the hell is awakened now. Double Smasher Punch just gently made enemies kiss the ground. Just when some pretty girl nearly got *ahem ahem*, Kaizer just squeeze the enemy pilot into luncheon meat (as in the Mazinkaizer SKL 3 minutes Promotion video shows). Double Smasher Punch. Ok, anyone want to hug me now? 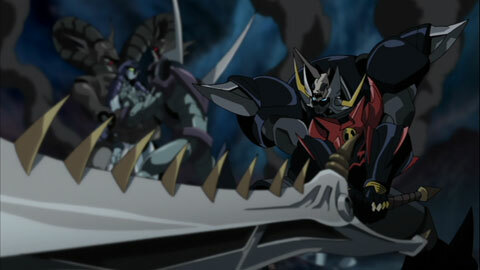 Ganzantou, Mazinkaizer SKL gigantic sword with fangs. Ken’s favourite weapon. Breast Triggers, Mazinkaizer SKL hand guns + knives. Ryou’s favourite weapons. Mazinkaizer SKL slaughters robot with its Ganzantou (the gigantic sword), blast enemies heads with Breast triggers and paint the battle field with blood and flame. Without the interference of the small flies, Ryou and Ken fight head on with Kiba and send him to hell. The ruins of Photon Lab. The timeline of Mazinkaizer SKL should be the future of Mazinkaizer anime. Wingle, a female support robot of Mazinkaizer SKL which looks like Minerva X. Pilot by Scarlet in the manga and Tsubasa in the anime. 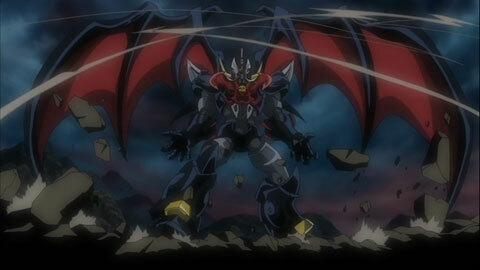 Mazinkaizer SKL with wings (scander unit?). It should be the complete form and apparently the wings on its head looks exactly like the one at Wingle’s head. Maybe they combined? I’m very excited after watching the episode one. Although the story is kinda plain but the battle scenes are really epic. 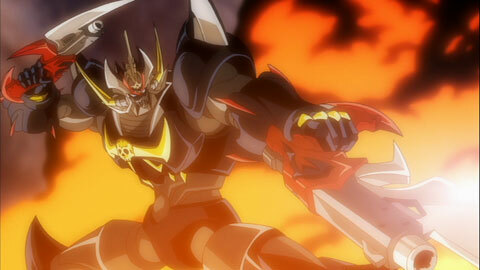 Mazinkaizer SKL anime is only 3 episodes and I really look forward for the future release. Looks like there is no way I can skip Super Robot Chogokin Wingle if I want to have the complete form of my Mazinkaizer SKL figure. I need to find the manga and perhaps the novel too just to have the complete idea of the SKL series. New Mazinger Anime! 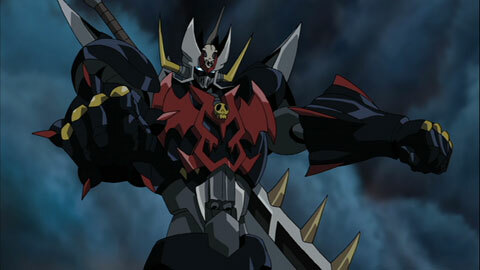 Mazinkaiser SKL (Skull)! when fighting with the dual pistols, SKL really moves like cleric John Prestin from the movie Equilibrium, which is very cool!